Okay. I’m excited about Taylor Swift’s new album. I’ve been a fan since her album Red. Love her or hate her, Taylor Swift does have an uncanny ability to capture the exquisite, tender experiences of girlhood in what she herself pens as screaming colour (see: All Too Well and 22). Unfortunately people often make fun of her for wearing her heart on her sleeve, the way people tend to belittle girls and their experiences in general. Even so, we put her on repeat because of how damn relatable her songs are. Also helps that her songs are catchy as hell. Then, as we all know, the Kanye and Kim debacle happened. There was a phone call. A drawn-out episode of he said, she said. Then Kim released a video that proved Taylor lied. America’s Sweetheart got labelled a snake. The media backlash was so intense, she went into hiding. 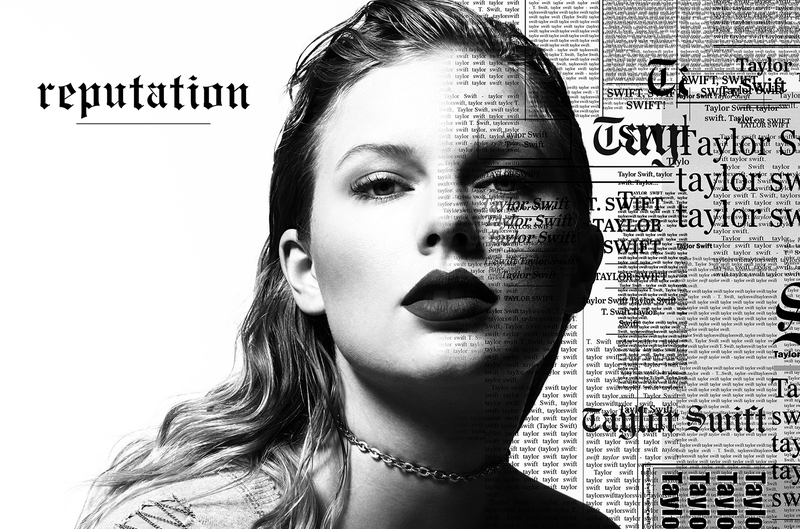 All of that drama is partly why her newest album, Reputation, is so highly anticipated. It’s quite obviously addressing her somewhat fall from grace. I don’t have a horse in this race – the Kim/Kanye situation did not affect what I thought of Taylor’s music, to be honest. It was just interesting to see how the whole thing would unfold. Frankly, I was a little taken aback by the angle she chose to take with her first single. Look What You Made Me Do is a common phrase used by people who refuse to take responsibility for their actions. Her most recent, Call It What You Want, was a yet another showcase of that. (Actual lyric: “All the liars are calling me one.” Yikes.) Even in Gorgeous, Taylor didn’t take responsibility for her attraction to the guy. Let’s face it, her victim complex isn’t a new thing (Mean and Better Than Revenge exist), but it didn’t really influence a majority of each album up to this point. It’s obvious the Kim/Kanye thing had affected her very deeply. Even though the rest of the world had moved on from it, she’s probably still feeling the aftershocks. All that said, as polarising as she is as a person, Taylor’s moral ambiguity is one of the reasons I personally enjoy her as an artist. On to the reading. For insight, I used a simple three card reading with the format of Problem – Cause – Solution to see if I could achieve some clarity into Reputation, and the psyche behind its conception. What are the problems that drove Taylor’s psyche during the makings of Reputation? The Three of Cups upright is one of my favourite cards in the deck. It’s the celebration of female friendships, the happy get-togethers, the toast at a wedding. It represents an exciting social life, one that brims with activity and clinking glasses. Everyone wants to get into this wonderful, exclusive circle. As a result they are usually the subject of others’ interest or scrutiny. The Three of Cups is the very essence of Taylor’s previous musical era. In this card, one woman stands out in the centre; she’s even dressed more prominently from her friends. She’s the driving force behind their coming together, possibly even the reason they’re toasting. Remember Taylor at the centre of her circle of gorgeous, leggy model friends? She may well have invented the term #squadgoals. She won a Grammy for Bad Blood, a video that featured the same squad of pretty girlfriends. She threw Instagram-worthy 4th of July parties. She had a string of famous people agree to guest star throughout her tour. She even jumped onto the feminism bandwagon and got both praised and crucified for it. This card identifies 1989. By turning up here in reverse, it offers the possibility that the party has met its end. The lights are on. Everyone is gone, and the house is completely trashed. A reversed Three of Cups would mean an excess of the positive qualities. A get-together turns into a hangover. Three becomes a crowd. Guests become a chore to deal with. Friends show their true colours; maybe they start hanging out without you. This card suggests isolation from friends and community. There’s definitely a sense of sadness to this card in reverse; the feelings that the party is done and reality has set in in the form of a hangover. My feeling is if there’s an estrangement between her and the people who once celebrated her, she’s at least equally responsible for that happening. From her own lyrics: “Windows boarded up after the storm.” Apart from the media pointing fingers at her, Taylor may have gone through a period of time where she felt abandoned by the people she thought were her friends. Besides the obvious humiliation from the snake incident, this may be the biggest reason she isolated herself. She didn’t feel like she could trust anyone, and as a result lost touch with a good number of them. The card also points at gossip and hidden enemies among friends, which may or may not be the actual case with Taylor. She may simply feel that way about the people around her. Our thoughts influence our actions, and if she thought this about her friends (and she did, looking at that poem), then her attitudes towards her friends’ perceived lack of loyalty will manifest it in reality. The Three of Cups reversed also suggests an imbalance between friends; did she demand too much from them, then feel disappointed when they didn’t deliver? What’s causing the problems manifesting in the first card? The Justice card is from the Major Arcana, which usually represents the karmic themes we struggle with throughout/at some point our lives. Whatever happens in your day-to-day life, certain themes and patterns keep returning to you, and there will eventually be a reckoning. For example, it could be dealing with addiction (Devil), or facing your fears (Fool). The Justice card upright represents a hard search for truth. It promises objectivity. If you’ve done your due diligence, and stayed honest with your counterparts, the outcome will be a fair one. As a reversed card, it suggests the opposite: a lack of accountability to decisions made, and an unwillingness to shoulder the blame. You’ve been exposed for the lie, but you think the world is treating you unfairly, and now you’re pointing fingers. This card screams persecution complex. We all know of Taylor’s tendency to play victim, and the Justice reversed tells us why. She legitimately sees the world in black and white. That her way is absolute, and anything that goes against that is a strike against her, even though that’s not necessarily the case. This attitude is not unique to Taylor; most (young) people think their point of view is the only valid one, that they deserve what they have because they are a ‘good’ person. But life is inherently unfair. The world operates in shades of grey, and we must learn to appreciate the layered nature in the situations that happen around us in order to move past our entitlement. To do this, she must first be accountable to her actions. Instead of crying foul when called out on her mistakes, it would benefit her to work harder to understand the root of the problem, no matter how complex it may be. In the Kim/Kanye case, it would probably do more for her to accept responsibility than thwart it. One of the reasons for the problems she faces with the Three of Cups reversed is her inability (at this point) to be more flexible with herself and the people around her. She must realise there isn’t a need to judge and crucify others for every perceived mistake, because in doing so, she only punishes herself. When you forgive others for their mistakes, you learn to forgive yourself as well. Her poem above perfectly exemplifies the Justice reversed. It’s encouraging that she recognises that being judgmental only serves to hurt her. In Taylor’s open letter, she talks about learning about the kaleidoscopic facets that make a person multi-dimensional, and that “we are never just good or just bad”. This is important. Because once a person understands this, they will be much less quick to judge someone. So I consider this is a step towards a heightened self-awareness, even if it has not yet showed itself in her lyrics. From Look What You Made Me Do: “I don’t like the role you made me play – the fool.” And yet it will not hurt to admit that, like the Fool, she does not know everything, and that she is susceptible to the failings that make us human. How do we move on from the current state of things? The World is the final card of the Major Arcana. It’s a positive card, and represents the happy endings associated with the successful completion of our soul journey. Again, this is a karmic card, and it makes sense for it to show up for Taylor. She is literally one of the most famous people on earth, and that is by no means any sort of exaggeration. It’s actually rather astonishing how influential she is. She’s one of the few people who can decide how her world is run. Look at how Apple and Spotify – two heavyweight tech companies – had to bend over backwards to her terms in order to feature her music. At the height of her 1989 fame, every other article featured both Taylor Swift’s opinions and lack thereof. She makes headlines for not saying a word. And this can be both boon and a bane. Having wielded that sort of power from a young age, it’s almost impossible for Taylor to separate her world from ours. She’s so used to having the world in the palm of her hand that it’s difficult for her to know any other sort of life. When people mess up in the real world, they go home to the comfort of their privacy and wait for the storm to blow over. This kind of luxury does not exist for her. Her name and reputation belongs to the world. No matter how long she hides physically, we will continuously redefine her image for her without her permission. This simply comes with the kind of fame she has. Showing up reversed, the World can mean a few other things. For one, the world is literally upside down – or perhaps it feels that way to Taylor. This can be a confusing and disorienting time – like she’s achieved so much, and yet feels lost. Despite her success (and the World does imply success; Reputation will in no way do any less well than its predecessors), there will be a sense of dissatisfaction lingering at the completion of this project. In more extreme terms, it can feel like a dead end to her growth as a person and an artist, unless she addresses the issues brought up by Justice reversed. With Justice reversed in the middle of the 3-card spread, it may also indicate trouble balancing her personal relationships (Three of Cups) with her worldly successes (The World). If she seeks more honesty within herself, she may find it easier to balance the two. The World is such a huge, overwhelming card when reversed. My feeling with this card is perhaps there will be rewards in returning to the basics. If it all feels too much, strip it back down to what brought you here in the first place. For Taylor, it can mean perhaps going back to her roots in country or guitar, or even perhaps turning her focus back to writing songs about the simpler, everyday experiences that made her so loved in the first place. Fifteen comes to mind. The fact that all the cards turned out reversed is a good indication that a majority of these issues are internal rather than external. The external world will always forgive Taylor for everything, in my opinion – the fight she has is within herself. Peace will come when she owns up to her decisions and makes a sincere attempt at cultivating a higher self-awareness. This, of course, requires time. The journey is hers to make; we are merely spectators. As always, the Wheel of Fortune continues to turn. She won’t be in this place for long. Let’s hope the next one is better.